Love of Music® Magazine Explores The History and Milestones of The Music Revolution. Thomas Edison invented the phonograph in 1877, months before starting experimenting with electric light. 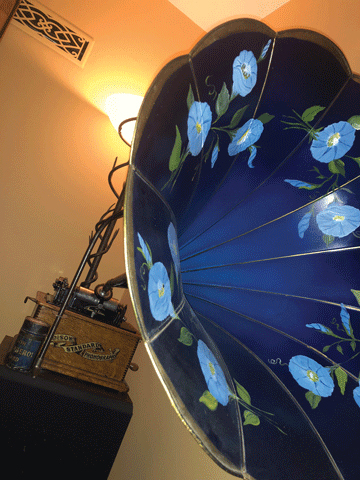 The first phonograph employed a cylindrical record that was powered by a hand crank and continued as the dominant form of sound reproduction until it was surpassed by the phonographic disc around 1912. 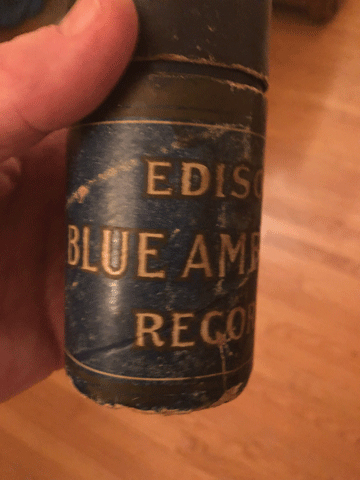 This local specimen is an Edison Standard Phonograph Type D and is capable of playing two types of recording cylinders: Edison Gold Moulded and Edison Blue Amberol. 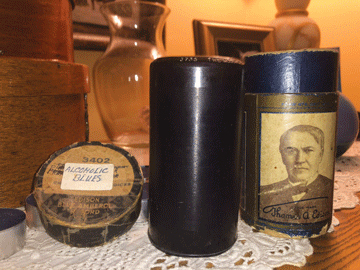 Each type of cylinder needed a specific reproducer to mount the record to the phonograph, Model C for the Gold Moulded cylinder which would play up to two minute recordings and Model H for the Blue Amberol cylinder that allowed for four minutes. Amplification required applied acoustic physics and came in the form of a 30-inch long horn made of eleven “petals” of thin metal. The horn interior is painted in a brilliant blue finish with morning glory flowers adorning the perimeter. Certainly, the Type D was designed to grab the eye as much as the ear. The selection for tonight’s performance is Alcoholic Blues by Vernon Dalhart, a four minute selection on a Blue Amberol cylinder. Over one hundred years later, the look and the sound are surely one thing: captivating. Up until the advent of recorded and reproduced music, the only way most people could hear music was to either play it or go see a band or group of people perform. One of the most popular cylinders, was Alcoholic Blues by Vernon Dalhart. 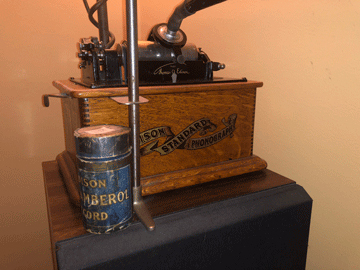 One of a few Edison Phonographs to have survived. This unit is in perfect working condition after over 100 years and is a perfect example of late 19th century technology.